A delicious crockpot chili with dozens of 5-star reviews and winner of multiple chili cook-offs! This crockpot chili recipe winner is made with plenty of spice and packed with lots of flavor. First thing first, this chili is not your typical “dump it and forget about it” crockpot recipe (like most of the crockpot recipes you see on my blog), but this chili is made better by being slow cooked. While there is a good amount of prep time with this crockpot chili recipe, it’s 100% worth it (and then some)! Not only are we making a massive batch of chili that you can use for several meals throughout the week (hello chili loaded baked potatoes, chili dogs, chili mac, navajo tacos, or taco salads), but it’s also large enough to serve quite a crowd if you’re taking it to a chili cook-off or potluck. So while this easy crockpot chili does take time, it is still extremely simple to make. Slow cooking this chili allows all the different flavors to meld together, the meat to get ultra tender, the beans to get delicate, and the veggies to get soft. Start by cooking the bacon in a very large pot. You’ll use this same pot to cook the veggies and meat in. Throw those veggies and meat into a large (must be 6 quart of larger) crockpot. Add in everything else — the beans in chili sauce, tomatoes, tomato paste, and all the seasonings. 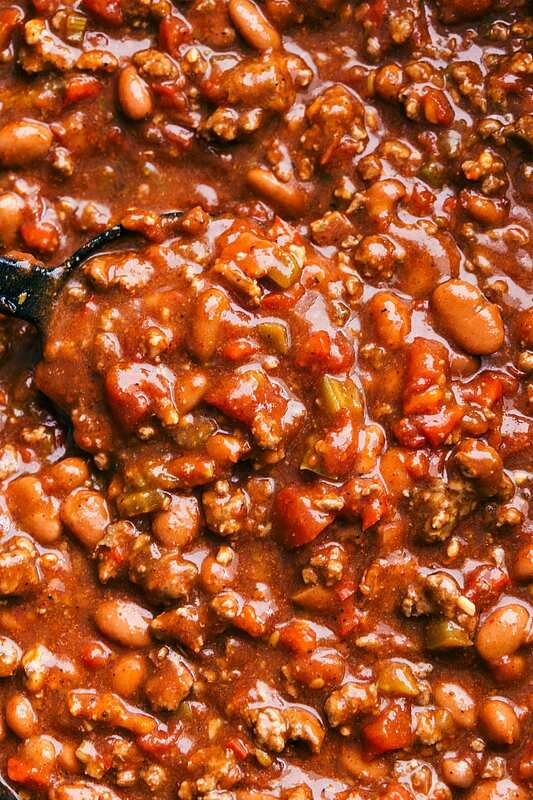 Give it a good stir and 6-8 hours later you’re ready to devour this crockpot chili! Slow cook it on low: this chili recipe slow cooker meal is best cooked on low for 6-8 hours. That way the flavors can truly marry each other and all the ingredients have a chance to get ultra tender. 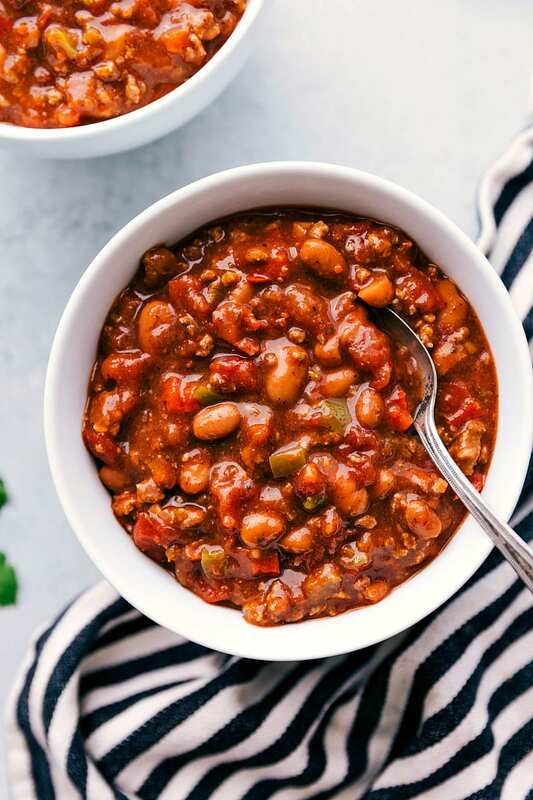 Ditch the seasoning packets: Throwing a spice packet into a crock pot chili recipe is fine for a quick meal, but this perfect chili recipe relies on our own spice blend! While I’ve included my favorite, feel free to adjust and experiment with the seasonings in your chili. Taste and adjust: remember to taste before you serve! 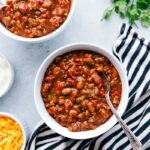 This crockpot chili might need a bit more chili powder, salt, or etc.. Start with the minimum amounts (as outlined in the recipe) and add any seasonings to your desired preference at the end of the cook time. 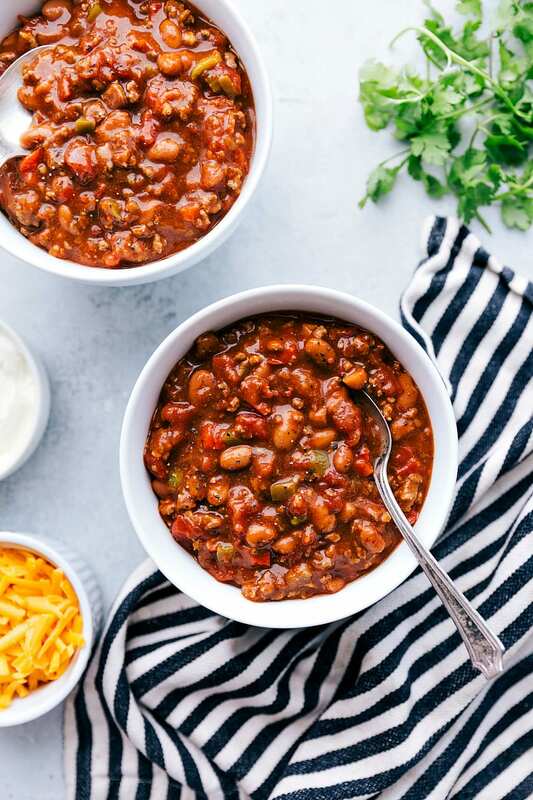 We love serving this crockpot chili with cornbread, baked potatoes or thick french fries, grilled cheese, or buttermilk biscuits. How can I use leftover chili? Baked Potatoes: add a few spoonfuls of this crockpot chili plus some cheese, green onions, sour cream, etc. Navajo Tacos: make or buy some fry bread, top with a few spoonfuls of this chili and add some cheese and sour cream. (More about navajo tacos here). Shepherd’s Pie: (kind of!) Use leftover chili as a base and top it with mashed potatoes. Use the ratios and mashed potatoes from this shepherd’s pie recipe. Chili Mac or Chili Dogs: Stir leftover chili into your favorite mac-and-cheese recipe! OR use leftover chili to top some grilled hot dogs. To freeze as a freezer meal: Mix all ingredients and place in (a few) freezer safe zip-lock bags. Freeze. When ready to cook, thaw in the fridge overnight and then cook on low in the crockpot. To freeze prepared chili: let chili cool completely to room temperature before putting small amounts in freezer safe bags/containers and freezing them. Freeze the bags flat to preserve the quality of chili and to make defrosting easier. Defrost in the fridge and warm through in the crockpot. Can you put raw meat in slow cooker for chili? Technically, if the meat gets to a high enough temperature fast enough (140 degrees F in less than 2 hours), it is food safe, but to make 100% certain you’re being food safe, I would not recommend it. Beyond the safety considerations, you’ll also be missing out on major flavor development that browning the meat provides. By browning the meat before braising (slow cooking), you’re developing deeper and richer flavors (known as the maillard reaction). So when we’re talking chili in a crock pot, it’s best to brown the meat first! Do you add tomato paste to chili? I do! I think tomato paste adds a delicious rich tomato flavor to this chili. One tip on the tomato paste — the higher quality, the better the flavor. I love San Marzano or Muir Glen tomato paste (not sponsored, just a fan!) for this crockpot chili recipe. I also highly recommend San Marzano or Muir Glen diced tomatoes for this recipe! In a skillet over medium heat, cook the bacon until crisp. Remove on to a paper towel lined plate and dab off the excess grease. Set aside. Reserve the bacon grease in the skillet. Remove the stem and seeds from the red pepper. Finely chop. Remove the stem and seeds from the green pepper and finely chop. Add the red pepper, green pepper, celery, onion, and jalapeno pepper to the skillet with the reserved bacon grease. Saute the veggies over medium heat until tender. Transfer to the crockpot. Add in the three cans of chili beans (undrained and do not rinse), petite diced tomatoes, and tomato paste to the crockpot. In the same skillet used to cook the bacon and veggies, cook the ground beef chuck and Italian sausage until no longer pink over medium high heat. Drain off all the fat and add into the slow cooker. 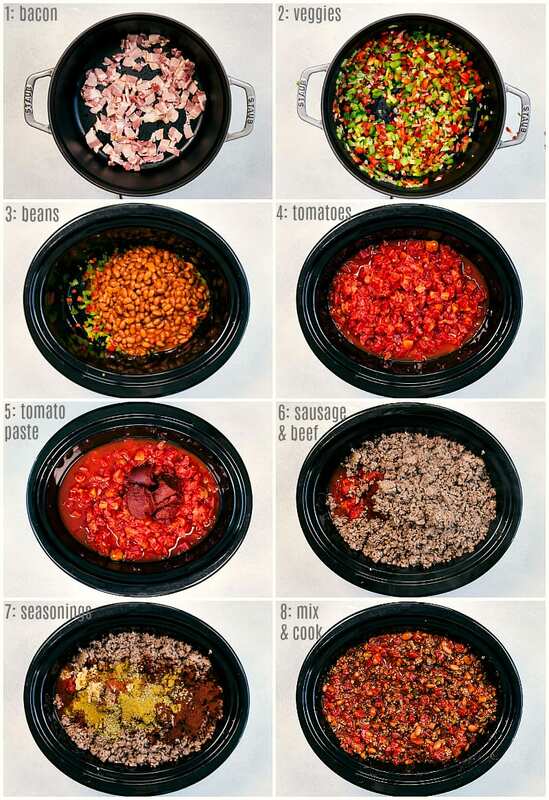 Add all the seasonings to the crockpot. Crumble up the bacon (or chop) into very small pieces and stir that in the crockpot. OR reserve the bacon in the fridge and add at the end. Stir everything together. Cover and cook on low for 6-8 hours. Taste and adjust seasonings (salt, pepper, chili powder, etc.) Enjoy with fresh cilantro, sour cream and cheddar cheese. I use a 6-quart crockpot and this chili fills it to the top! It makes a lot which we love to eat throughout a whole week, take to a chili cook-off, or freeze in batches 🙂 *The jalapeno pepper(s) adds a lot of heat. Omit or reduce as desired. It’s just was I needed these days. Oh, and the video is really helpful! Thanks! Mmm I don’t think I’ve had bacon in my chili before, and I don’t know why because it sounds amazing! What a perfect comfort dish, Chelsea! Love this! Chelsea this looks delicious! My family loves their chili with lots of meat! And who can resist a crock pot meal! It is going on the menu next week! I made this according to the recipe, turned on my crock pot, worried at how full it was but gave the recipe the benefit of the doubt, and left for my daughter’s basketball tournament. Thankfully I was able to come home in between the morning and afternoon games because it was a horrendous mess on my counter. I had to pour the chili into a big roasting pan, put it in a low temperature oven, and clean the counter and my crock pot. It’s a 6 quart Rival Crock pot. How in the world is that supposed to work? It tastes good but WHAT A MESS!! How am I the only one with this problem? That is so strange Collette! I’ve made this dozens of times and heard great things from readers and never had it escape the crockpot! Did you put it on high or change the recipe in any way? I too have a 6 quart and it has never even come close to coming out… Was it boiling over? If so, it may be that the heating elements of your crockpot are off. It was on low and I followed the recipe. No clue. I just know that if I fill my crock pots (embarrassingly I have 4!) to the very top it always boils over. Does yours not come to a boil or does it not fill it to the top? You are *officially* my favorite person because this recipe helped me win a chili cook-off! Hooray! It really is the best though. and didn’t change a thing. Thank you Chelsea! I made this yesterday. About a dozen people and they ALL loved it. The only thing I changed was I added a few canned chipolte peppers. Incredible recipe. Thank you Chelsea. How would you cut this down in order to make it in a 4-quart slow cooker? Made the bacon chili in slow cooker yesterday- YUMMMOO I love mushrooms so added some as well. Awesome recipe and is definitely a keeper thanks ?? Awesome!! The mushrooms sound delicious 🙂 Thanks so much for the comment John! Thank you Chelsea… We took 1st place in the Chili Cookoff Challenge this past week! Not bad for a guy who has never made Chili … EVER! WAHOO! So happy to hear this won you the 1st place, made my day! 🙂 Thanks Scott! How would you alter the recipe if you left out the beans? I made this last week for the first time and this is the best chili I have ever had and or made. I finished off over 1/2 the crock pot by myself. (took a couple day) and never got tired of eating it. Two Thumbs up on this recipe. I made a second batch in a 7 qt. Crockpot and brought with me to work. I arrived at 830 am and it was still warm from the night before. At 845am one of my workers grabbed a bowl and that’s all it took. By 10.15am it was gone. They are requesting another batch next week. I’m on a low sodium diet, if I reduced the beef bouillon to 1 cube or maybe left them out all together, do you think it would destroy the taste? I don’t think it would destroy the taste, but it will be a little less flavorful. You can leave it out and add one after a taste test if you want! Herb-Ox has “sodium free” bouillon. I notice in the video you use what looks like Knorr brand bullion cubes. These are usually one cube to two cups of water-while other brands are one cube to one cup of water. So if I don’t use Knorr brand should I be adding 6 cubes? I’m wondering if the video is making them look larger than they are; I used the regular sized bouillon cubes (1 cup to 1 cup water) Hopefully that helps! Could I add beer or some other type alcohol(bourbon maybe) to this? If so, what amount would you think? Considering adding either a bottle of beer or 1/4 to 1/2 cup bourbon. This recipe looks so delicious! I’m planning to make it for a family party this weekend. I do have a question for you, when you let it sit in the fridge overnight, do you still cook it in the crockpot 6-8 hours first and then cool it down and refridgerate over night? Or do you cook everything and mix it all together, but rather than cooking it in the crockpot at this point put it in the fridge and then the 6-8hours in the crockpot is done the next day? Thanks for your help! Thank you April! I fully cook, allow to cool, refrigerate, and then heat the next day 🙂 Enjoy!! So excited to make this for a chili cookoff tomorrow! Had a quick question — have you tried cooking this on high (for 3-4 hours or so) and then refrigerating overnight, instead of low for 6-8 hours? I hope you take home first place! 😉 I have never tried cooking this on high, but I do find I like beef soups/stews/chilis (other ones I’ve tried) best on low. I see chili beans can be either red beans or kidney beans. Which do you use? Hi! I used this recipe tonight in a chili cook off and it won!! Thanks to much! So happy to hear that! Congratulations 🙂 Thanks for the comment! If you cut recipe in half do you cut cooking time in half? I’d still keep around the same cook time; maybe an hour less. We took 3rd last year in our chili cook off using a 22qt roaster. Getting ready to fire it up for this year but can’t remember what temp we used. Our toaster doesn’t have low-medium-high settings. Thoughts? Just found this recipe on Thursday and made it yesterday. The taste was amazing. This looks great and I’m looking forward to trying it this week. But if I want to leave out the sausage, should I replace with another lb of beef? Yes, I’d recommend that 🙂 Enjoy! I’m not a fan of beans, so I’m not a huge fan on chili. My daughter’s first birthday party was this weekend and we had a chili bar. I grabbed this recipe offline, had good reviews and looked easy. It was a great decision!!! Everyone at the party raves about how great it was! Apparently it is extremely similar to a family friend’s late mother’s recipe; which is a huge compliment as her mother was an incredible cook. I will definitely be making this a staple for chili cook offs and other events! Yay!! So happy this chili was a hit 🙂 Thanks for the comment Kristi! I read where you said that you made this in a 6 quart but I only have a 4 quart so I did it on the stove because I have a 6 quart pot and it still turned out amazing. Low and slow for 4 hrs and I’ve never made chili before. This is even better than my mother’s(RIP) recipe. My kids licked their bowls clean. I made this according to directions last night .. it filled to the top lip of a (Rival) crockpot but did not boil over. Two thoughts: one, no where in the recipe did it say to drain the grease from cooking the ground chuck and sausage. While that was my natural inclination (kinda gross otherwise) I did drain off a full 16 oz can of grease. If I had not, that 16 oz would have put the crockpot overflowing at some point. I know it sounds logical to drain it off, but since it’s “no draining” on the beans, and the tomatoes, perhaps there was confusion there. I might also guess that depending on the fat content of the beef/sausage, some may cook down more than others – mine was close enough to the top that an extra cup might have made a difference. This chili is now on it’s way to a support station for a team of 41 mile hikers (the full Maryland AT trail segment) as a benefit to Operation Second Chance and I am sure they will all be grateful for this fabulous chili! Thanks! I am very excited that I found this recipe. I had originally planned on doing a dump and cook meal but this looks way better. But I need some clarification. I want to do this right and prepare this in advance (a day) and then wake up the day of the potluck lunch and put the chili into the crockpot, warm it up, come home, grab the crockpot and take it to the potluck. Do I warm this on “Low” or “Keep Warm” setting? I will probably want to pick it up around 11:00 AM to have it at the potluck by 11:30 AM. I did google reheating Chili in a crockpot and got all kinds of articles about food poisoning so as much as I want to make a good impression with the chili, I don’t want to make anyone sick. Obviously you have done this a time or two so wanted to ask how you have reheated the chili after refrigeration. Thank you in advance for your response. Hahahahaahahaha that is SOOOO true!!! Sounds great going to try soon. Can I use home canned salsa with jalapeno peppers, tomatoes, and onions? Do you want to just add in the salsa or use it in place of the diced tomatoes? How do I reheat it if i make them refrigerate overnight? Turn crockpot to cook on low? Im making your crockpot chili and my question is concerning the bouillon cubes. In the video it looks like you’re crushing them into the pot dry but someone asked about water. Do I crush them in dry or dissolve them in water? Crush them in dry! 🙂 Enjoy! I have a question, I over looked the ingredients and bought 2 cans of pinto beans and 1 can of kidney beans. None of them are in chili sauce. What would you recommend I do? And would I drain the juices? I would drain and rinse the pinto and kidney beans. Without the chili sauce, you might just want to bump up some seasonings to taste. Enjoy! Can I substitute beef broth or beer for the boullin cubes.? I wouldn’t recommend either because they’ll turn the chili into more of a soup consistency. The boullion cubes gives the flavor without all the extra liquid! Best.Chili.Ever! I rarely follow a recipe exactly but almost did with this one! I did substitute 2 cans black beans to the three cans in the recipe since I’m not a huge fan of beans. And I like chipotle chili powder better than cayenne. It’s smokier and although hot, doesn’t quite pack the punch of cayenne. Anyway, I love this chili and although it’s not one of those ‘just throw in a couple items in the crockpot’ recipes, it is so worth the effort. YUM! Hands down the best chili I have ever made. I followed the recipe exactly as written and the chili turned out perfect. Had a crowd in (and boy does this feed a crowd) and everyone loved it. Still had enough left over to freeze. I modified this to fit into a 4qt crockpot and made it for dinner for some friends. It did not disapoint. They really enjoyed it. Do you suppose I could use Rotel in place of the Jalapeno and Diced Toms? Hi, Chelsea, this looks delicious and can’t wait to try it. I love that this is done in a crock pot. I do have a question about the bouillon. Have you ever used or tried “Better Than Bouillon”? Just wandering if that could be used in place of the cubes. Thanks for any help you can give me. Have a wonderful and blessed day. :). Omgoodness!!! This chili came out wonderfully delicious!!! My husband did the shopping for the recipe and preferred to leave the jalapenos out, (which I kind of wanted) so I added a little bit more cayenne…I have never in my life tasted chili this good. I tried to make my mom’s recipe last winter, with no success, but I cannot wait for her to try this!! I have a friend that can’t eat pork. Would you skip the bacon entirely? Or substitute turkey bacon? I’m excited to try this! But what on earth are chili beans in mild/medium sauce? I’ve never heard of such a thing. I wonder if it’s regional- I’m in NYC, & found your page from a quick google. In any case, I’m going to make this tomorrow, but with jalapenos in adobo sauce instead of straight jalapenos. I could eat that adobo sauce stuff straight from the can!!! I made your recipe a few days ago minus the jalapeno’s. My family has a more sensitive pallet to heat then I do! Lol. Thank you sooo much for publishing this recipe. It was absolutely delicious and a perfect way to warm up from the cold and snowy day. I will definitely be making it again! I haven’t made this yet – wondering how spicy it is and if I can make a mild version? Our kiddos don’t love spice, but they do like chili! And bacon ? Hey Lonni! I would leave out the jalapenos, use all chili beans in MILD sauce, and potentially decrease the chili powder, cayenne, and paprika (add slowly to taste!) Enjoy! As soon as I read, “sautée veggies in bacon grease” I knew it was gonna be an amazing chili haha. This is awesome. I also added some tortilla flour for a thicker consistency and won 1st place in a chili contest. thanks for the wonderful recipe!!!!! I won a Contest with this Recipe. However, I made a few minor changes. I smoked the ground chuck and my sausages in the smoker. I also did not add the celery. Came out Perfect! This is the best chili I’ve ever eaten. Sorry I did have to modify the recipe for my son who doesn’t eat beef or pork. I used 3 lbs of ground turkey instead. I also added a can of chipotle salsa, used smoked paprika, and replaced 1 can of tomatoes with Rotel as I was afraid the turkey would be bland. It filled my 6 qt slow cooker to the top and everyone loved it, it was gone in 2 days. I’ll try it one day with the beef, sausage and bacon, I’m sure the flavor is even better. Thanks for posting I added this to my favorite recipes binder!! It seems kind of thick? I just put it into the crockpot. Should I add a cup of water? It is definitely thick! But as it slow cooks, a lot of liquids are released. I wouldn’t add water unless you’re looking for a soupier consistency! Awesome chili! Won our chili cook off on Friday with this recipe! I made this chili exactly as per the recipe for Super Bowl. I used hot Italian sausage. Absolutely amazing!! I will never buy a seasoning packet mix again. I made this on Saturday, put in the fridge overnight and re-heated in the crock pot on Sunday. Amazing. The sour cream on top with grated sharp cheddar and a fresh sourdough loaf for dipping was just amazing!! Thank you for sharing such a wonderful recipe. We had a chili cook off at work and I signed up even though I’ve never made chili. I love cooking and when I read your recipe it had all the right elements; texture, technique, good ingredients, and above all great advice! Im happy to announce I just won our first chili cook off with this recipe! It had it all, great aroma, two types of beans, two types of meat, great aftertasteand bacon! Great job Chelsea! Definitely going to come back here for other recipes! YAYYYY!! This made my day! I’m so happy everyone enjoyed! 🙂 Thanks so much! Best chili I’ve ever made!! Thank you so much! I’m a huge fan of your blog by the way! We love this recipe. It’s the only chili we make now. We add a few more jalapeños or sub serrano peppers and add a bit more bacon cause we love bacon! Regardless it’s awesome every time! Am I the only one who wants to hear the chili cook off story!? What chili cook-off did you win? Or did you adapt the recipe from another winner? Can’t wait to hear the story! Hi I wanted to use 2 cans of black beans instead. Can you please advise how many tomatoe cans to use instead? 2 cans of black beans instead of what; the tomatoes? I am making the chili as I write this the recipe calls for 1 tbsp of minced garlic. Is that dried minced garlic or fresh? Trying this recipe tomorrow. Just wondering if I were to add macaroni noodles, how do you suggest adding those in the process? I was maybe thinking to just cook the noodles separate and then dump the chili over the noodles. Thanks for the great recipe. Won 2nd place at chili cook off at church this weekend. Even my daughter that doesn’t eat ground beef or chili tried it and loved it. Hi! I am having people over tomorrow and serving this chili! Can’t wait to have it. Could you please give me info regarding serving size. I track my food everyday to help me stay on goal and it would really help me if I had an idea of serving size. Hey Donna! I hope you and your guests love it 🙂 There are 10-12 servings, so if you divide all of the chili into 10 or 12 equal parts, each equal part is one serving. 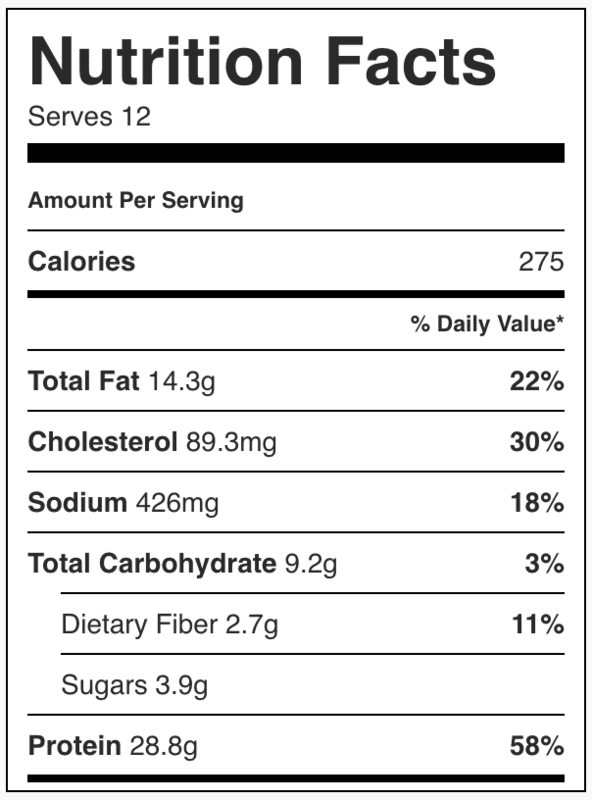 (The nutrition facts indicate 12 servings, so you’d divide it equally into 12 parts and each part would be 275 calories) Enjoy! Made this today while preparing for the Bomb Cyclon snow storm here in Denver. I usually make Green chili but decided on this comforting red chili. By far the best chili I have ever had!!! I substituted 1lb of beef for some grnd Viel I had on hand. Only put 1 can of tomatoes because I couldn’t fit it in my crockpot😂 It is fabulous Chelsie! Thanks for the recipe! This recipe was quite good. I followed the directions to a tee and made no tweaks to it. I found the recipe to be a little salty for my taste. We did think it has a nice kick of heat to it. Next time I would reduce the cayenne for the kids sake. The recipe is basic. It really is. But you forgot Cocoa or a piece of high cocoa chocolate and a bay leaf. Also Mexene Original Chili Powder is the only one to use.